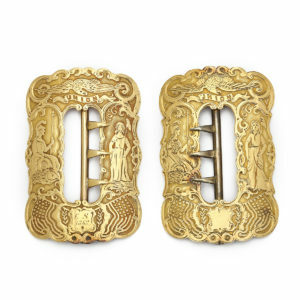 Remnants of the golden dream, these buckles of California gold commemorate the state officially joining the Union in 1850. The design includes imagery from the California coat of arms. On the left, the goddess Minerva sits with a grizzly bear at her feet, referencing how California, too, came fully formed, having no territorial probation. In an 1854 history of the state, one author notes how “the plain traveller [sic] from the east will notice the profusion of rich jewelry worn here by every class, and by both sexes.” Naturally, the adventurers headed west to seek their fortunes included jewelers. Through the jewelry companies they formed they aspired to deflect attention from the jewelry centers of the east and provide the entire Pacific coast with jewelry from San Francisco. It was not uncommon for the forty-niners to send relics of their labor to loved ones left behind. Those with the tools and time fashioned nuggets into rings, crosses, and other pieces of adornment. Others sent small amounts of gold for family members to have made into wearable relics by their local jeweler.